Carol was born in Lancashire in 1961 and studied art in Brighton. After working as an illustrator on a variety of projects she finally decided to devote herself to a career as a full time fine artist. 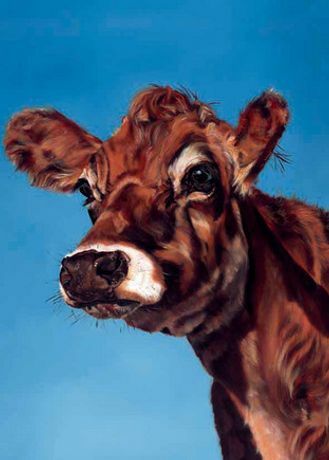 Now based in Surrey she paints from a studio in her home and specialises in dramatic and humorous animal portraits. Carol travels to County fairs for inspiration and often accosts dog walkers when she sees a dog that she would like to paint. Due to the nature of her work (or rather the nature of her sitters) she tends to make extensive use of photographs that she feels best capture the individual identity of the animal in question. These allow her to achieve an informal, composed painting which is both a realistic likeness and a uniquely distinctive interpretation. Carol prefers to work in oil on canvas. Over-painting thin layers of oils she slowly builds up the image, closely cropping the actual subject to maximize its impact and presenting it against a solid background of vibrant colour. She employs the medium of oil because it adds such depth to each image, enabling her to portray the texture of an animal's coat, the shadows of its muscle tone, and especially its personality which she believes can be conveyed through the expression in its eyes. Carol's work has been exhibited widely across the UK and Europe and she has undertaken a variety of impressive commissions for individuals and corporations. In 2006 she was awarded first prize in the prestigious DeMontfort New Artist competition. I love painting animals - they come alive for me making for a hugely enjoyable experience. I like to look for that something extra. For me it's no good painting a straightforward portrait: I like to take an alternative approach, bringing the viewer face to face with a living breathing animal and hopefully creating an interactive experience - a dialogue."